Welcome to the Tri-Cities House of Prayer! Why Day and Night Prayer? The heart of the vision of day and night prayer is found in Revelation 4 & 5. This passage of Scripture reveals unending worship and prayer around God's throne in heaven. Jesus teaches us to pray, "On earth as it is in heaven" (Matthew 6:10). King David had an understanding of this amazing truth. Around 1,000 B.C., he established a tabernacle in Jerusalem that set a precedent for night and day worship before the Lord. In David's tabernacle, Levitical priests ministered continually before the Ark of the Covenant for approximately 33 years. As a result, the nation was blessed by God all the days of David's reign. After his reign, however, subsequent kings abandoned this pattern of worship, the people turned from the Lord, and the nation suffered the disciplines of God. However, whenever a righteous king would rise, seek the Lord and re-establish worship according to David's pattern, spiritual breakthrough and God's blessings followed. 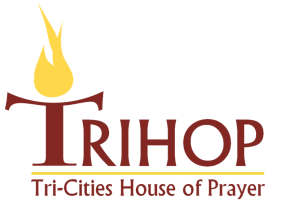 We, at TRIHOP are laboring to see the church come into what will be it's full identity at the end of the age, a house of prayer. We are also laboring to see a worship sanctuary/prayer furnace that will go 24/7, day and night. Knowing it will be built on the knowledge of God, we are boldly asking God to establish it in our region. We are living in times on the earth when crisis is apparent and escalating all around us. We see the breaking in of God's temporal judgments and the increase of disobedience to God. It is clear and consistent in Scripture to what the people of God are supposed to do in a time of crisis. The prophet Joel prophesies to the nation of Israel in a time of great crisis to "Blow the trumpet...consecrate a fast, call a sacred assembly." Everyone is to gather together, from nursing babes to elders, and turn to the Lord with all their heart, "with fasting, weeping, and mourning" (Joel 2). This is God's prescription when we face trouble. It is simple, yet this prescription is often overlooked, marginalized, and not valued. And the strength of salvation"
There is a famine of the knowledge of God in the land. Even in the church as a whole there is a shallow understanding of who God is and what He is about. The knowledge of God is the number one commodity that we can acquire in these perilous times we live in to help us be prepared for coming days. We also receive direction, clarification of our priorities, and encouragement for our souls when we pursue the knowledge of God. We cannot live without study of God's word coupled with a lifestyle of prayer and fasting. Join us as we "press on to know Him" together!